After you’ve gone through all the trouble to cut and arrange flowers, make sure you help them stay fresh and beautiful! Flowers cut from the garden usually last 3 to 5 five days. Flowers from the florist usually last a week or more since they sell only those flowers bred to last a long time in the vase (they may look like heck in a garden!). • Cover as much of the stems as possible with water. 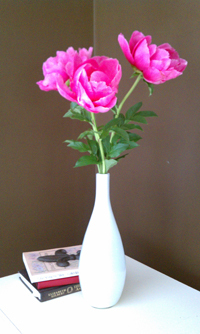 The deeper the vase and the longer the flower stems, the better they’ll be able to absorb the water. (Also check the vase daily to top off the vase as needed with more water. • Change the water daily. Otherwise bacteria builds up (evidenced by cloudy water and that yucky smell) and reduces the flowers’ ability to take up water. • Strip off lower leaves. Use your fingers to strip or pull off any leaves that would be below the water line. The rotting leaves contribute to the bacteria build-up. • Use a floral preservative. You can buy this in liquid or powdered form at crafts stores and florists’ shops. Or add a teaspoon of sugar and a teaspoon of lemon juice (bottled is cheapest) to the water to feed the flowers and to acidify it to reduce bacterial growth. • Keep it as dim and cool as is reasonable. Granted, if you want to put the flowers in the middle of your warm, sunny kitchen table, do it. But the more time cut flowers spend in a cool, not-bright environment (think fridge), the better. • Trim the bottoms of the stems every two or three days. Pull the flowers out in a bunch and trim off the bottoms with garden shears or scissors. It opens fresh pores in the stems so the plants can better soak up the water. • As flowers fade, just pinch them off or pull them out. You can still enjoy the remaining flowers that are fresh. Put them in a new, smaller vase if necessary.